BMW Motorcycle Club of Hampton Road invites you to join us for our 41st annual BMW Motorcycle rally. 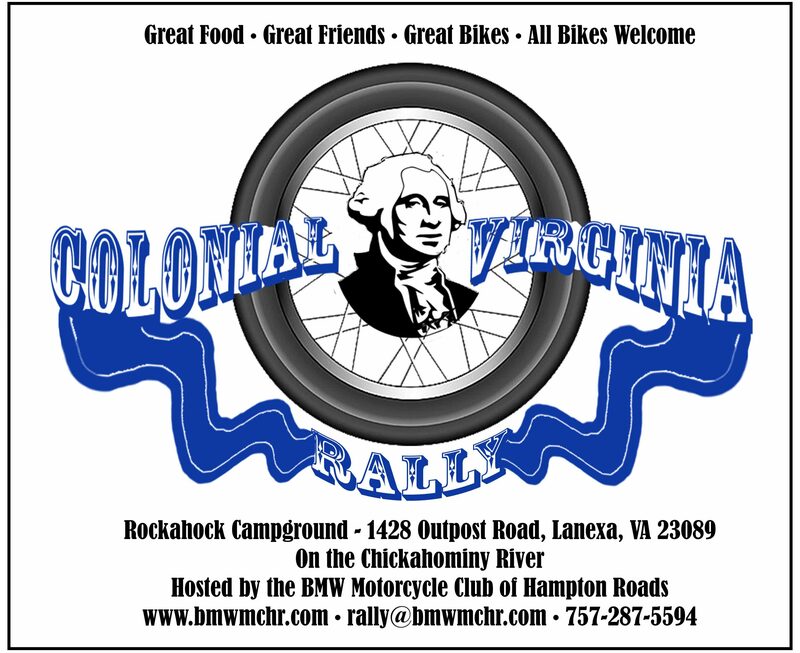 Our rally site is the Rockahock Campground just a little north of Williamsburg and just outside the Historical Triangle of VA. Many wonderful historical sites (Williamsburg, Jamestown, and Yorktown) are close by with great riding roads. We have an action packed weekend planned from Friday night dinner and movie to a charity ride Saturday morning and field events Saturday afternoon. Saturday dinner will be a wonderful pasta bar with all the fixings. Onsite Registration is $60. This includes 2 nights of tent camping, Friday and Saturday dinners, free flowing coffee and tea, Door Prizes, and field events. Preregistration fee will be $50 with a deadline for preregistration of September 8th 2018. Any questions contact our rally chair, Carol Beals, at 757-287-5594 or rally@bmwmchr.com. All makes and models of bikes are welcome. This is a full service campground located on the Chickahominy River. RV sites, Yurts, Villas, and Cottages are available from the campground at a 10% discount when mentioning the rally. Their site is www.rockahock.com . We understand not everyone likes to pre-register. Weather, life, all kinds of things can get in the way. If you are thinking about attending and want to register on site please let us know by filling out the form below. It will help us in planning for meals and events. I am interested in attending the rally, but will register on site.